Take a look at that dashboard: It's clearly presenting the driver with a selection of apps, each with a simple, readable icon. This isn't some 2015 future-mobile, though. It's the Ford 24.7 concept, a design exercise from January 2000—seven years before most folks came to know the concept of "apps." 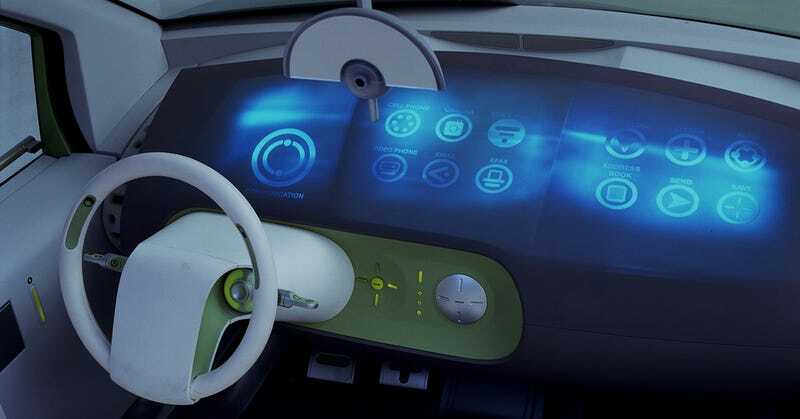 Despite being dreamt up at a time when most new cars came with CD players as an option, the 24.7 envisioned an automotive future where cars became an extension our increasingly connected digital lifestyle. I spoke with Richard Pelletier, a former Ford designer under J Mays who worked on the 24.7 concept. "We thought about this as like, 'what if Apple made a car,'" Pelletier told me. "I can't believe how, I don't wanna say 'predictive' because that sounds like chest-beating, but how we came to a solution that seems pretty cool. The whole entire dashboard [. . .] each one of those circular icons is an app." The system was built around a rear-projection dashboard displaying a variety of icons. Functions were divided into groups like Safety, Communications, and Connectivity, the groups chosen by push-buttons on the dash. "Each button basically brings up a whole new set of icons on the screen. It's like swiping through the screens on your iPad," Pelletier told me. Recall that this was a full decade before the world would see the first iPad. Unless you were a serious first-adopter or a Palm Pilot power-user, the concept of "apps" was far from the mainstream in 2000, and touchscreens were rudimentary and imprecise. So while the visual design of the 24.7's dash is evocative of our tap-and-drag smartphones and tablets, the user interface was completely voice-operated. "We assumed voice control would be fine, so you could go with a really clean, minimal number of buttons," Pelletier said. "We were trying to go with almost no button controls and we were assuming voice control would be 99.9% accurate and robust." The result is an almost entirely un-cluttered dashboard, a nearly unfathomable sight in the year 2000. This minimalist design carried on to the outside of the 24.7 concept, which wore three different body styles: A family station wagon, a hatchback, and a mini truck. "The exterior of the car was just a frame, it wasn't a style statement at all. It was a frame for information, almost like the iPhone design strategy in a way," Pelletier told me. "I think it worked well both in terms of framing the technology and being a background or platform for the technology, it also worked well as an actual style statement for the exterior." Like most concept cars, the Ford 24.7 was too unabashedly optimistic to turn into any kind of production car in the short term. The technology it promised wouldn't exist for several years—we're still wrestling with voice-activated digital assistants, and giant video displays still haven't gotten cheap enough to find their way into affordable family cars. "But this is what concept cars are for,"Pelletier told me. "We did a little bit of an exaggeration I'd say, almost like to provoke conversation, provoke the world into questioning what the future would be like." Fourteen years later, the 24.7's app-like layout looks familiar to anyone who's ever palmed a smartphone. It was shockingly predictive, even if the layout it foretold wouldn't reach consumers for nearly a decade. It was a striking bit of precognition. But there's one more bit that Pelletier wishes his team could've seen coming. "I always wonder what would've happened if we'd said hey, why don't we sell downloadable music on this platform?" All images courtesy Ford Motor Co.